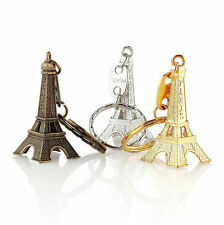 Cute,3D,Eiffel Tower Charm Pendant. 12pcs keychain(Colour randomly). Minister bottom width 2.3 2.3cm. If you are not satisfied with the item, you can. A good gift as a French Souvenir for your friend, family and lover. Tower Length:4.0cm/1.57"(Approx.). Material: zinc alloy. So beautiful with the scene of Paris Eiffel Tower. 1pc x Fridge Magnet. Strong magnet, easy to attach the fridge. It will add much beauty and fun to your fridge. Size: 7.8cm x 0.5cm x 4.5cm/3.1" x 0.2" x 1.8". Large metal, possibly brass, Eiffel Tower souvenir statue. Measures approx. 22cm tall. Good vintage condition with minor signs of wear commensurate age. Hallmarked Italy inside. Genuine vintage item, not replica. Please see photos as they form part of the description. 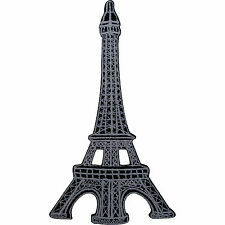 Vintage Eiffel Tower souvenir Paperweight. Goldtone & marble look plastic. Eiffel Tower Paris. Goldtone tower and weighted marble look base, all plastic. In good condition, just a little wear to the goldtone on the tower front. high inc. base.